You do not have to be a genius to recognize that traditional classroom education is just not enough to take on today’s competitive environment. Technology is changing everyday and our conventional education system is making no attempts to keep up with it. This phenomenon is only making it harder for companies to find suitable candidates for vacancies and for students to find great jobs. Well to balance out this disparity and to help you stay ahead in this cut-throat world, we introduce you to SlideRule. This platform is here to help folks learn in-demand job skills, by giving them a curated online curriculum and a personal expert mentor. The mission is to make high quality professional learning accessible to anybody, anywhere around the world, at a fraction of a cost of traditional classroom programs. 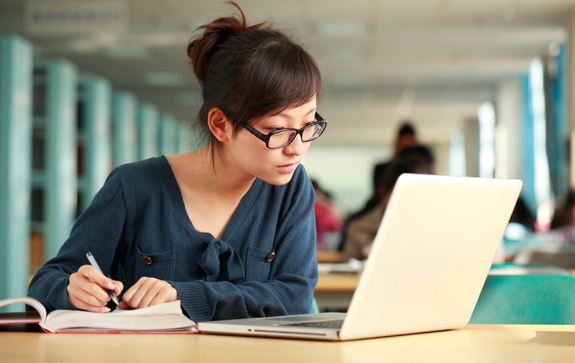 This platform also has several free online learning resources for self-learners. SlideRule is the brainchild of Parul Gupta and Gautam Tambay. For the duo their team at the startup is what they are *most* proud of. Parul graduated from IIT Bombay in 2002 and UCLA in 2003. She has worked for 10 years in research and technology startups before starting SlideRule. Her co-founder, Gautam has a B.Tech from IIT Delhi and a MBA from Wharton. His past work experience includes working in analyst and business development roles in Capital One, Bain & Co, and Inmobi. Their team consists of some really promising talents. It includes Jeet and Anshu who are the super-stars behind all things tech while Rajit is the growth and marketing magician. Monique – the latest addition to the team – is an amazing athlete who helps out with everything from managing the student community to product, process and pricing ideas. “We are a young and fun loving team, bound together by the mission of improving education for the world. We go out together often – at the best microbreweries, movies, play arenas and music gigs in town”, says Parul. SlideRule is addressing the infamous talent gap where companies find it hard to hire good talent, and student/professionals find it hard to get great jobs because of the shortage of necessary skills. Our traditional university and classroom education system is not able to keep pace with the rate of technology evolution and most of what is taught is already obsolete, or will be in 5 years. The team realized that there is a dire need for high quality programs for lifelong professional learning. Online learning offers a beautiful opportunity because it opens up access to the best experts wherever they might be in the world. It also allows people to learn at their own pace. This is the new shared knowledge economy! “Both Gautam and I had long been excited about the potential of online-learning in opening up quality education to the world, and wanted to work in the space. The year 2012-13 brought an inflection point as the Massive Open Online Courses (MOOCs) made people more open to learning online. We started with building a simple search and review engine for online courses. We kept talking to the users who came through that, and this deepened our product till it evolved into a full-fledged mentor-led online program”, says Parul. On Road Block & Competitors! When you have conviction matched with a great team, no hurdle seems insurmountable. That said, doing an education startup for the team was fundamentally hard. This was because it involved the complexities of the human mind and issues of motivation. The team was aware that there are no shortcuts, but they also realized that there is a great need and a great opportunity if they solve the problem. In short, they are committed to this space for the long-term. In terms of competition, this space though not fully explored still as some serious competitors. The professional learning space is growing fast with recent successes like Lynda, PluralSight and Udemy. However, most of the action has been around creating content. On the contrary, SlideRule is building the glue around content which converts it into learning. A few other players like Udacity and Thinkful are working on a similar model, but everyone is still early in the game. On Plans Of Expansion & Targeted Audience! “After several successful pilots, our focus is now on scaling up the paid workshops and streamlining our student and mentor operations”, says the team. At the moment, SlideRule’s primary audience is college students or working professionals who are looking to improve their skills for work or learning just for fun. They are distributed all over the world, with the biggest share coming from USA. “From the millions of users who come to our site for the free learning resources, a portion sign up for the paid workshops where we provide students with a curated curriculum and a personal expert mentor. This is our primary revenue stream”, says Parul. To sum up everything precisely, SlideRule is your one stop platform for all your learning needs. Sign up with them today to muster new learning in order to advance in your career. The team of SlideRule was kind enough to offer our readers with some exciting offer. They have the next batch of Data Science and UX workshops starting in the 3rd week of Feb and for every friend who signs up on your invitation, both of you will get a $50 credit. Write to founders@mysliderule.com for more details! Learn To Play Music In Your Smartphones With Uberchord Engineering! Previous articleSpeakDocs Reads Your Documents To You In 26 Languages! Next articleHave Conversations On Any Topic With Poundcake!